Fasten your seatbelt and take a ride with us into the past! 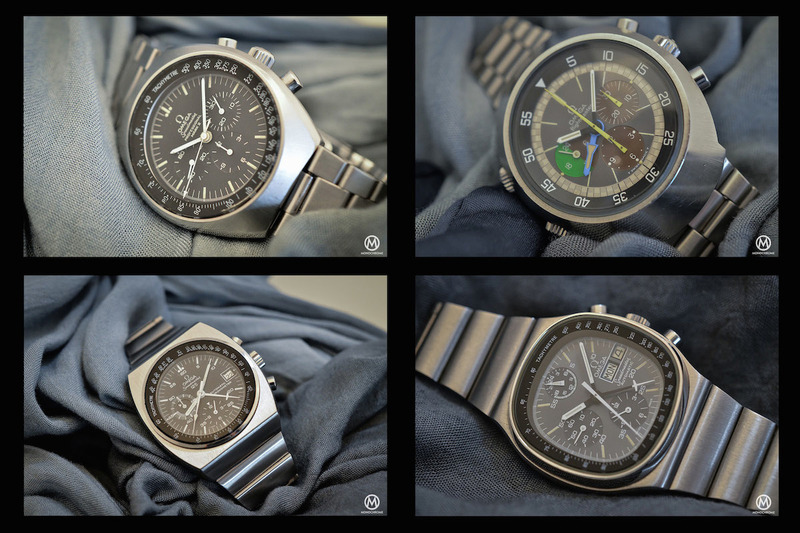 In this 3-part story, we will try to show you the most important pieces of the huge Omega Speedmaster collection. We had the chance to handle the watches from the Omega Museum (that were presented in the Parisian Boutique during a special event), all fully original or even prototypes of one of the most important chronographs ever made. To start the journey, we’re going to cover the 1957-1969 period, also known as the pre-moon times. 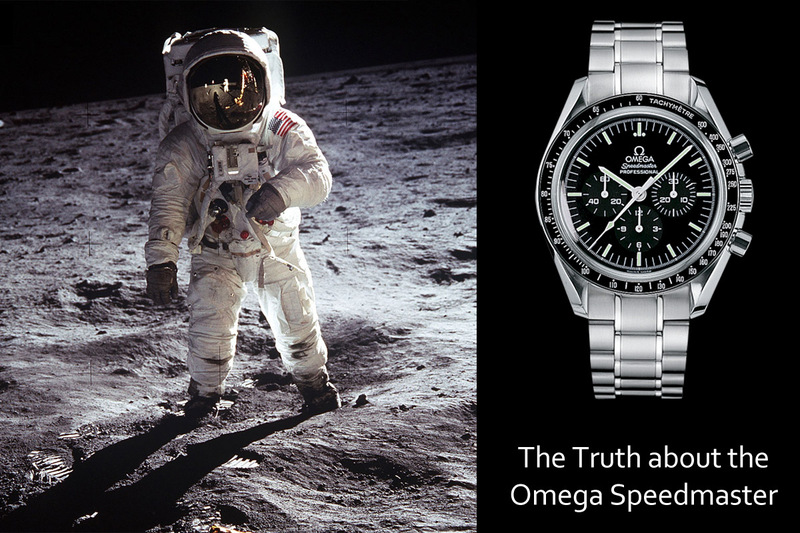 Even if it is now known as the ‘Moonwatch’, the Omega Speedmaster wasn’t developed with this idea in mind. Back in 1957, it was part of the “Professional” collection, alongside the Seamaster 300 and the Railmaster. The ‘Speedy’ was introduced as a racing and sports chronograph, complementing Omega’s position as the official timekeeper for the Olympic Games. Such a watch was a useful tool, with its 1/5th of a second chronograph. Keep in mind that in 1957, quartz watches were only at the very beginning of their development. 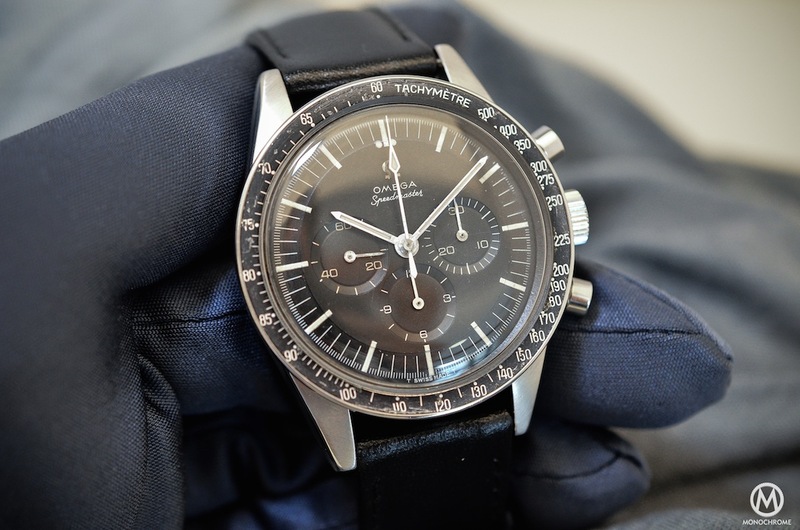 The Speedmaster only drew the attention of NASA in 1962. 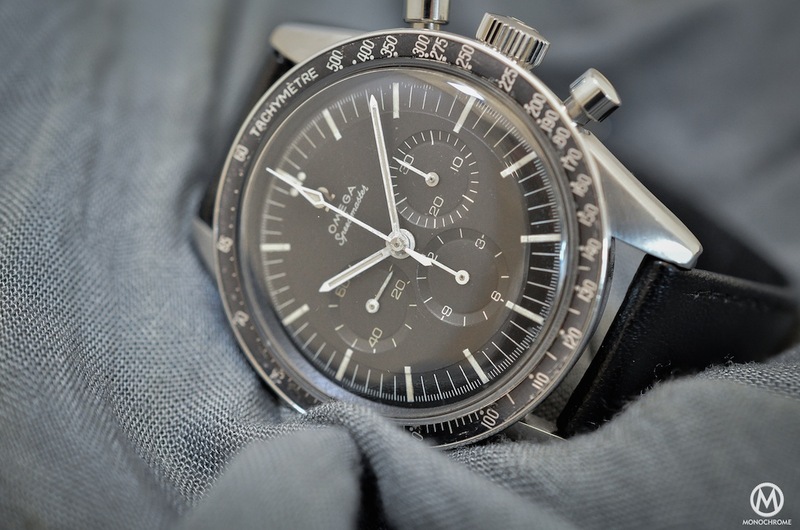 Wally Schirra – but also Gordon Cooper on Mercury 9 – one of the first American astronauts, wore its own Omega Speedmaster CK2998 on a Mercury flight, October 3rd, 1962. This was a private purchase and had nothing to do with NASA. The astronauts kept pushing for something like an official watch that could be worn during space missions. NASA realized that “private” items (like these watches) were used during the missions and also realized that this practice poses many dangers. By 1964, they started thinking that a certified watch for their astronauts was a real and important need. 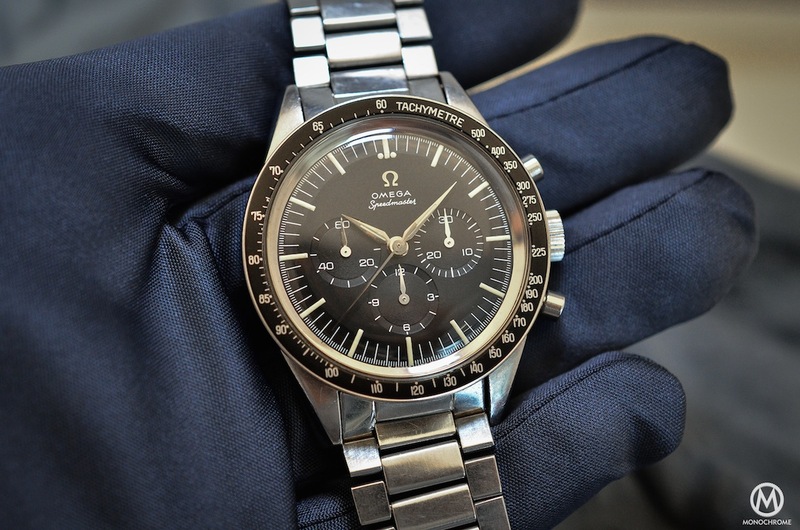 NASA decided to procure (not buy) several chronographs including, Longines-Wittnauer, Rolex, Hamilton and of course an Omega Speedmaster (note: Waltham and Bulova were not contacted). The legend that NASA bought watches from a Houston dealer is untrue. NASA, a government agency, is not allowed to “buy” items. The truth, related to us by the Omega Museum, is slightly different. Based on a letter of requirement (1964) by Deke Slayton, the whole watch-testing was organized by James H. Ragan (at the time a young engineer at NASA) and by late 1964 a request for quotations was sent to several watch brands. In case of the Swiss brands, this was sent to the agents/importers of the brands and not to their offices in Switzerland. This is the reason why the brands did not know at first what was going on. Only 4 brands answered back: Longines (via Longines-Wittnauer USA), OMEGA (via their agent in New York, Norman M. Morris), Rolex (via Rolex USA) and Hamilton (then still an American company). Together with the request for quotations, NASA (via James H. Ragan) sent a specifications-sheet. In it there were many details about what exactly NASA wanted to see. Hamilton responded by proposing a pocket-watch chronograph out of their military products range instead of proposing the required wristwatch chronograph. Therefore, James H. Ragan did not include them in his testing. The entry was disqualified. High temperature: 48 hours at a temperature of 160°F (71°C) followed by 30 minutes at 200°F (93°C). Low temperature: 4 hours at a temperature of 0°F (-18°C). Temperature-Pressure: 15 cycles of heating to 160°F (71°C) for 45 minutes, followed by cooling to 0°F (-18°C) for 45 minutes at 10−6 atm. Relative humidity: 240 hours at temperatures varying between 68°F and 160°F (20°C and 71°C) in a relative humidity of at least 95%. Oxygen atmosphere: 48 hours in an atmosphere of 100% oxygen at a pressure of 0.35 atm. Shock: Six shocks of 40 G, each 11 milliseconds in duration, in six different directions. Acceleration: From 1 G to 7.25 G within 333 seconds, along an axis parallel to the longitudinal spacecraft axis. Decompression: 90 minutes in a vacuum of 10-6 atm at a temperature of 160°F (71°C) and 30 minutes at 200°F (93°C). High pressure: 1.6 atm for a minimum period of one hour. Vibration: Three cycles of 30 minutes of vibration varying from 5 to 2000 Hz. Acoustic noise: 130 DB over a frequency range of 40 to 10,000 Hz, duration 30 minutes. 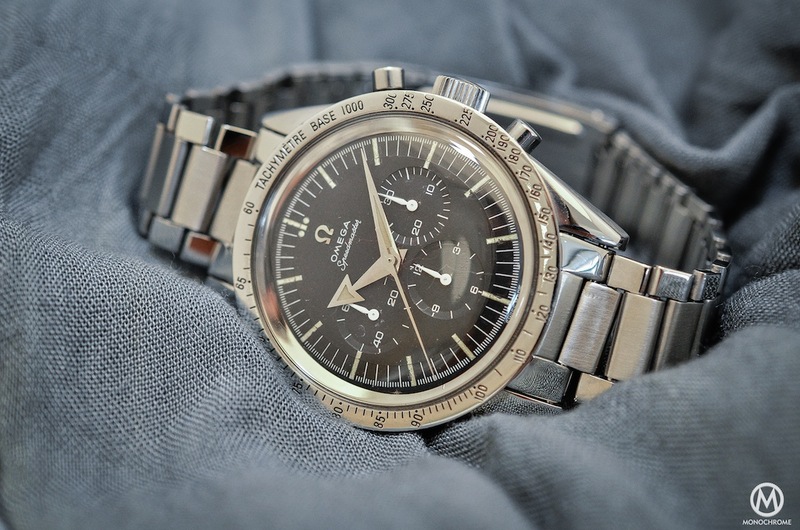 After an intense procedure that went from October 21st, 1964 to March 1st, 1965, only the Omega Speedmaster survived and NASA declared it operational for space exploration and flight certified: ‘Operational and environmental tests of the three selected chronographs have been completed; and, as a result of the test, Omega chronographs have been calibrated and issued to three members of the Gemini Titan III crews.’ This goes against the urban-myth of the long 3 years testing program, which is confirmed by the Omega Museum to be wrong (The OMEGA Museum works since two years directly with Mr. Ragan (ex-NASA) and at the same time with the Smithsonian Institute as well as with several other sources in Houston. 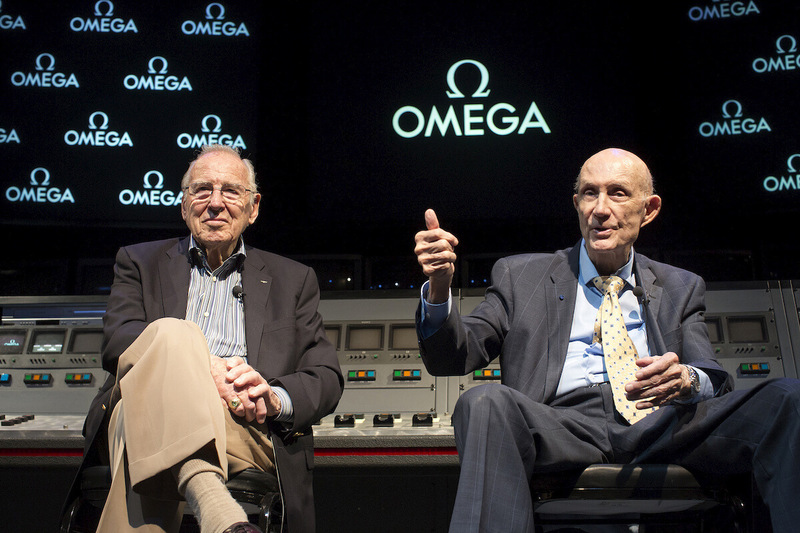 Omega have finally been able to put the whole history together, backed-up by countless original documents – most were previously classified – both in Houston and within countless archives discovered in the vaults of the Omega museum). 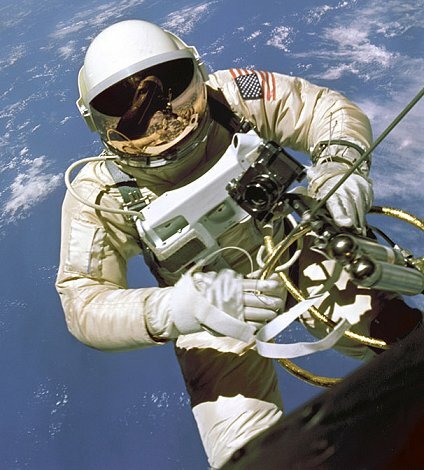 Omega Switzerland learned about it only after seeing Ed White wearing a ‘Speedy’ strapped on his wrist with a Velcro band during America’s first spacewalk as part of the Gemini 4 mission in June 1965. 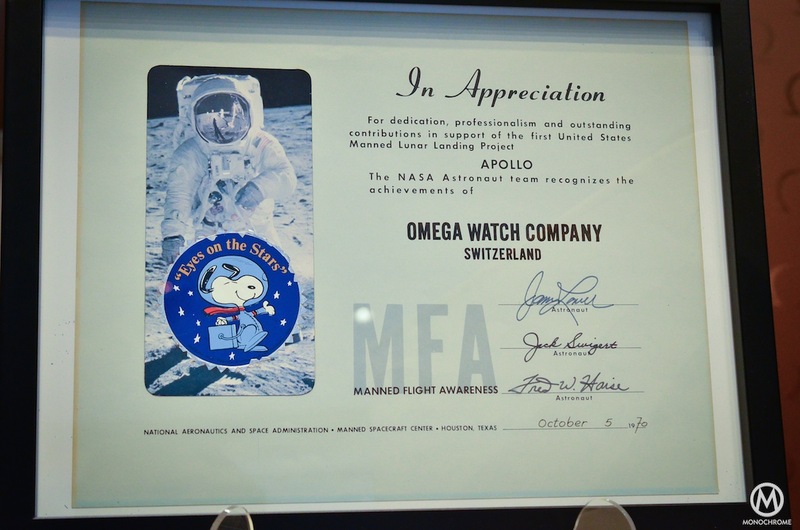 And to this day, the Omega Speedmaster remains part of astronauts’ official equipment. The story began with this one: the reference CK2915, the ultimate grail for every collector of Speedmasters. It’s now a very rare bird that can reach more than 40K Euros in auctions. 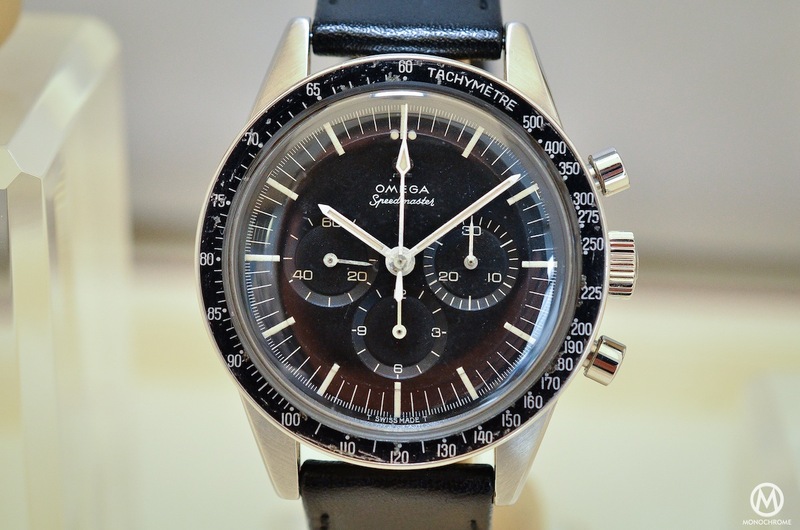 Back then, the Speedmaster, was already popular, a fact that pushed Omega to keep updating this model. It was a big and sporty watch in a world of small gold and dress watches. What is amazing when you handle it now is how modern it looks and how closely it resembles today’s Speedmasters. The Speedmaster was part of the iconic 1957 trilogy: CK2913 Omega Seamaster 300, CK2914 Omega Railmaster and CK2915 Omega Speedmaster. 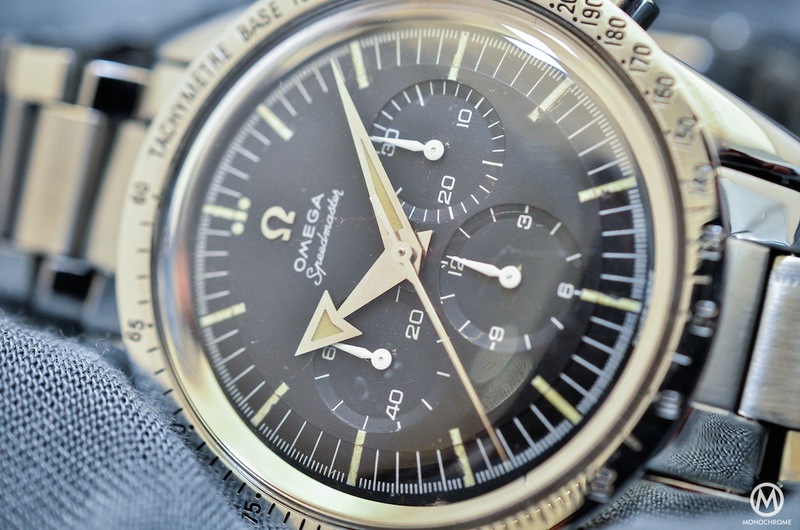 The name ‘Speed’ was chosen because of the tachymeter ring that encircles the dial (this was actually a world-premiere at the time as the Speedmaster was the very first chronograph to take the tachymeter away from the dial and to have it on a bezel outside the crystal). The rest of the name follows Omega’s convention: ‘Master’ was used for the professionally oriented watches, such as the Seamaster (diving tool) and the Railmaster (antimagnetic tool for engineers). The first Speedmaster is known as the CK2915 ‘broad arrow’ because of its hour hand (a type of hand that can also be found on the early Seamasters and Railmasters). Two other main differences can be seen on the dial and case, compared to later editions: a metallic tachymeter bezel with engraved numbers and a simple baton second hand. The rest is very similar to the actual ‘moonwatch’ with a 3-register dial and luminous baton indexes. The black oxidized dial is called a ‘step dial’ because of the recessed part around it. The 3 sub-dials are also recessed, with a circular guilloché finish. Hands and indexes are filled with radium. 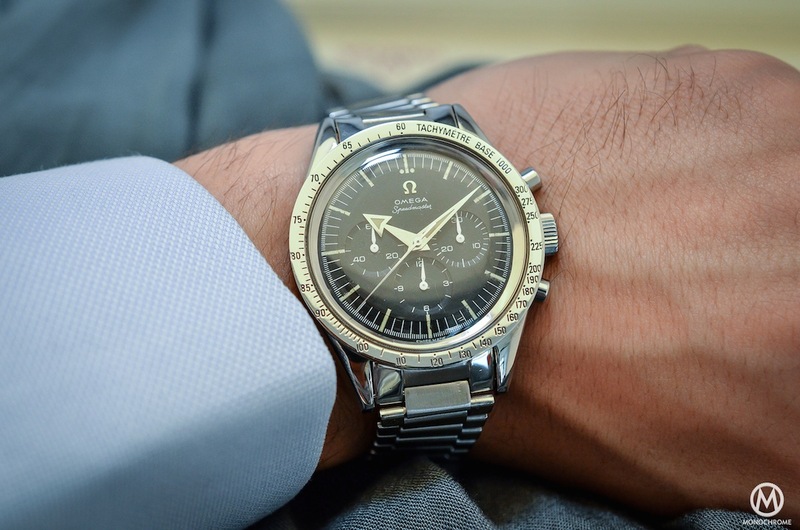 Omega chose to use the Calibre 321 to power the Speedmaster. 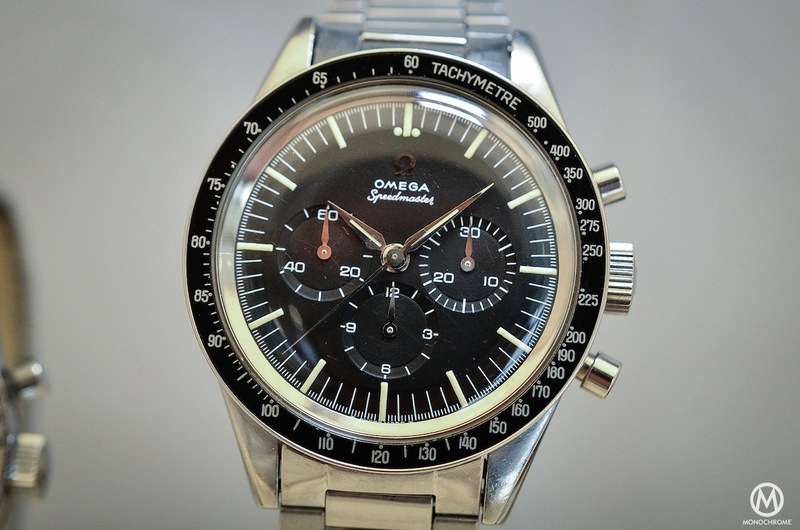 It was introduced in 1942 and came from a joint venture between Omega and Lemania. The ebauche used is the Lemania Cal. 2310, also used by Vacheron-Constantin or Breguet. The chronograph functions are controlled with a lateral clutch and a column-wheel. It also features an antimagnetic cover and a shock-protection mechanism. Even if it is simple and old-fashioned, it is still recognized as one of the best chronograph movements ever produced – and a nice one too. 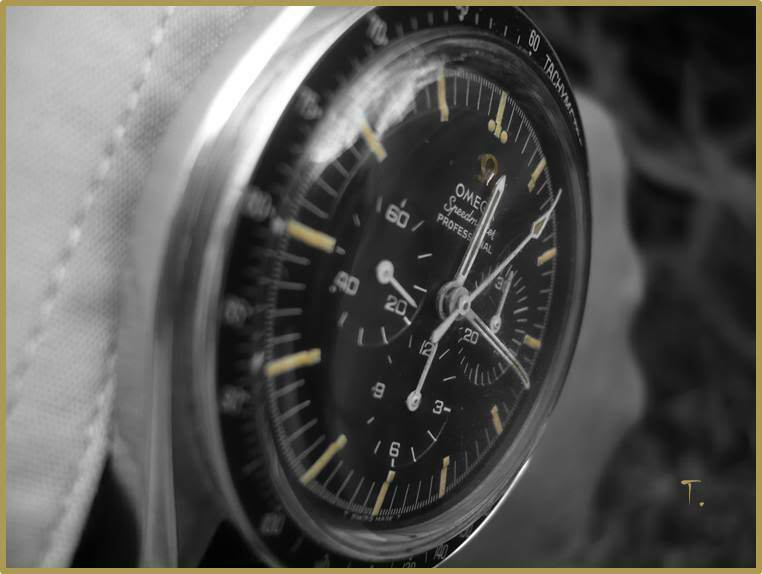 The Omega Speedmaster CK2915 lasted for only 2 years (1957-1959) and was replaced by the CK2998. The CK2998 represents the second step of the Speedmaster’s (long and rich) history. It was presented in 1959, bringing with it several improvements and aesthetic changes. But it is important also because it’s the first ‘Speedy’ that went to Space. Wally Schirra was wearing his own Omega Speedmaster CK2998 during the Mercury 8 flight, October 3rd, 1962. A funny fact is that Wally’s father was Swiss – maybe he gave the passion of watches to his son, who was the first to prove the efficiency of the ‘Speedy’ to NASA. 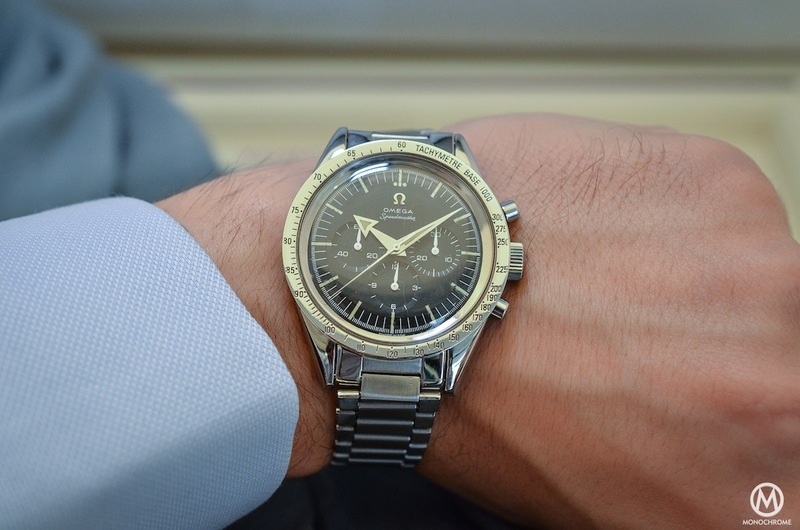 This first Omega in Space is now famous and was re-edited with a special edition in 2012, the Speedmaster FOIS (First Omega In Space) that features the same case, dial and hands design. Even if technically identical, the CK2998 came with a new tachymeter bezel made of a black aluminium insert that improves readability, and the ‘Alpha hands’ which are a distinctive feature of this reference. The one we had the chance to handle featured the simple baton second hand, without any luminous material, but some of the CK2998’s were also delivered with a ‘lollipop’ second hand – a straight hand with a luminous, radium-filled dot on the top, inspired by military watches. 2 other small differences have to be noted: a slightly bigger case – 40mm vs. 39mm, due to the new bezel – and the addition of O-ring gaskets around the pushers to improve water-resistance. The CK2998 is a truly great watch that is easier to find in auctions or on the second-hand market – and for a lower price compared to a CK2915. It is also an important one, with a great history and a superb look, mixing both the vintage elements (alpha hands, straight lugs) and more modern ones such as the black bezel. 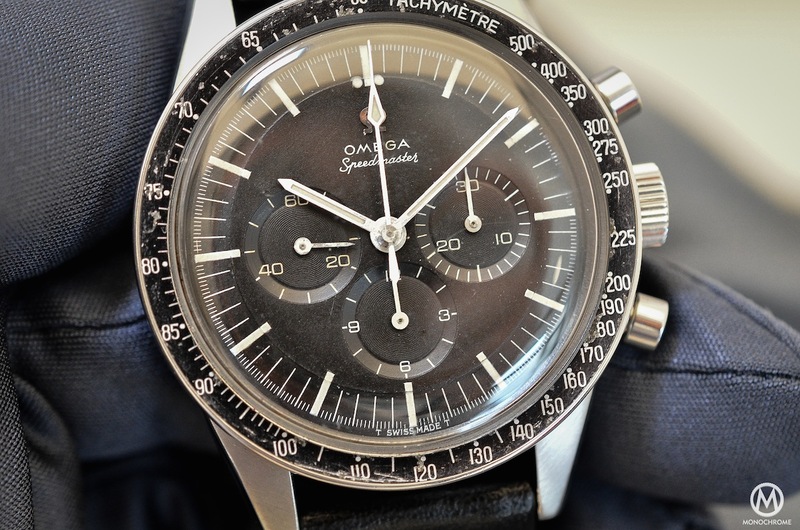 In 1962 Omega presented the Speedmaster ref. 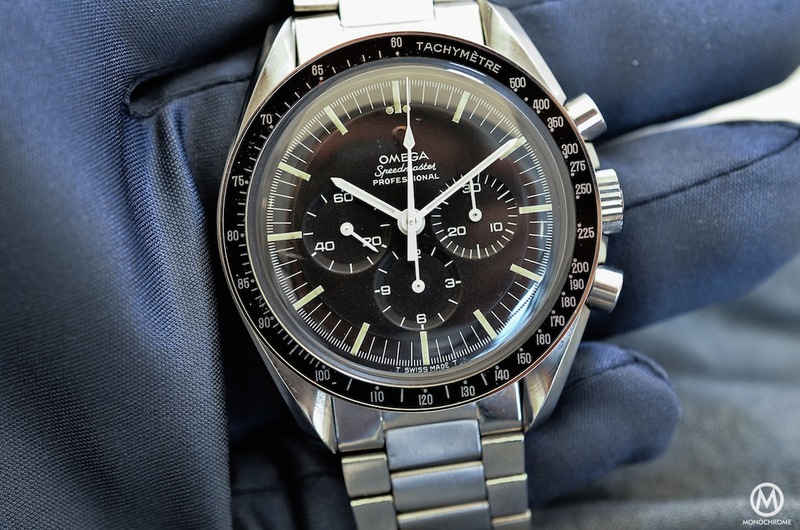 105.002 and in 1963 the Speedmaster 105.003. Both have a similar design, however with one (minor) technical difference. The diameter of the bezel has been enlarged from 38.6mm to 39.7mm between these two references. For the rest of their characteristics, though, these are essentially the same watch. 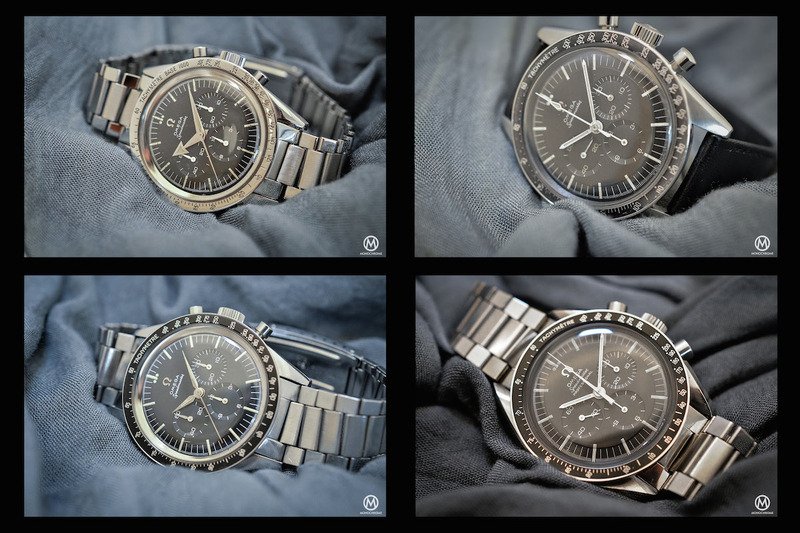 The 105.002 and 105.003 changed some of the Speedmaster’s design aspects, especially the hands. They were the first ones to feature the baton hands that continue to adorn the modern Speedmasters nowadays. The minutes and the hours are indicated by straight, white, luminous (filled with tritium) hands while the sub-dials’ hands are simple white batons. The chronograph central hand has a diamond shape (with the top part filled with luminous tritium). However, this lattermost hand features a ‘water drop’ shaped counterweight in the vintage specimens, whereas those of modern ones are straight. The case still has the straight lugs design and the bezel insert is still in black anodized aluminium. However, that insert was available with several printings: tachymeter (to calculate speeds), pulsometer (to calculate heart beats), telemeter (to calculate distances in meters), telemile (to calculate distances in miles) or decimal (for industrial timing, statistical analysis, calculation of averages) – you can find more to read about these bezels on Chuck Maddox’ website. The 105.003 is the reference originally tested and selected by NASA for the astronauts’ equipment. It was discontinued in 1966 and replaced by the reference 145.003, the last of the ‘straight lugs’. Second, the ST105.012 illustrates the evolution between the old vintage Speedys and the modern ones. 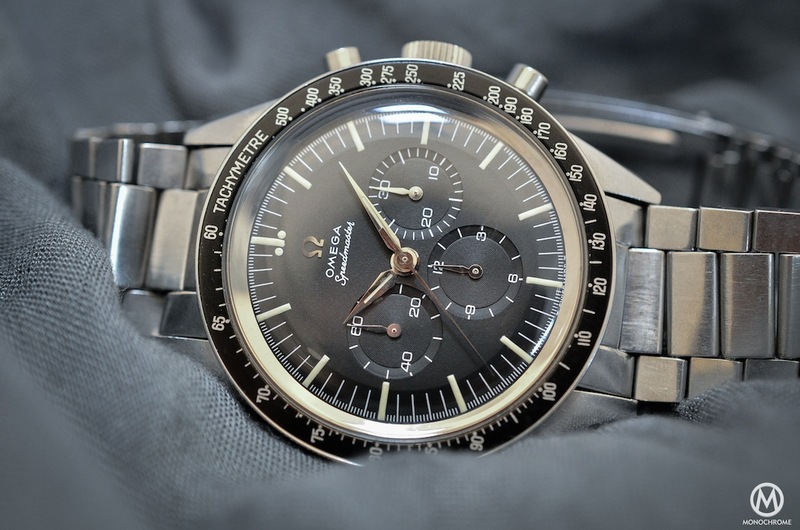 The ST105.012 has to be recognize for what it is, THE link in the Speedmaster’s history and THE real ‘Moonwatch’. 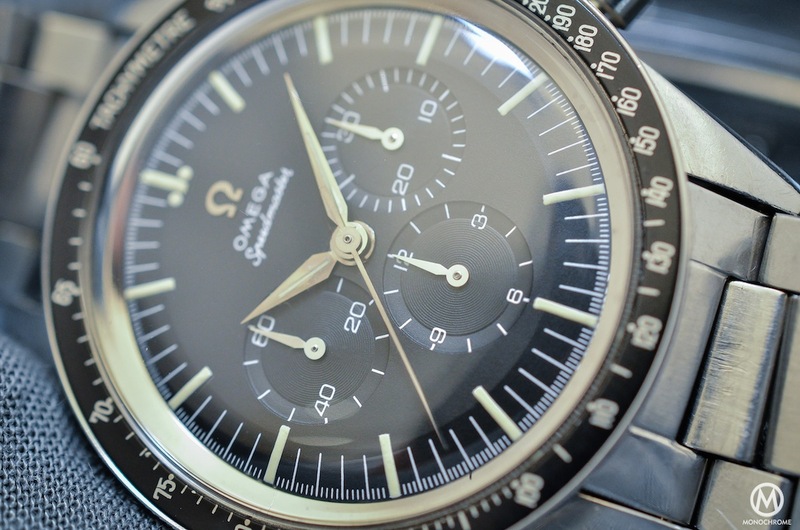 The 1963 Speedmaster ST105.012 is the reference that ushered in the most aesthetic changes. The major improvement was the new design of the case. Omega decided to add some protection to the pushers and the crown, creating an asymmetrical design of the sides. The lugs were now faceted and called ‘Lyre lugs’. The whole case had a diameter of 42mm (compared to the 39mm of the first CK2915 and 40mm for the rest of the straight lugs references). And the final improvement was better water resistance due to the use of a rubber membrane inside the case, next to the pushers. In the heart of collectors, the ST105.012 was the first of the Moonwatches and the last to include the magnificent 321 Calibre, alongside the 145.012. After that, Omega moved to a cam-operated movement, the 861, which was introduced with the reference 145.022. 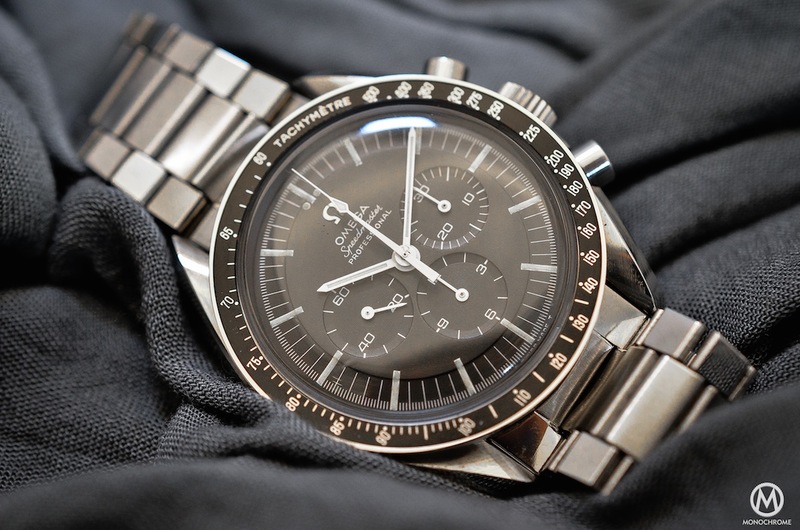 However, from a pure design standpoint, it is very close to the current Omega Speedmasters. 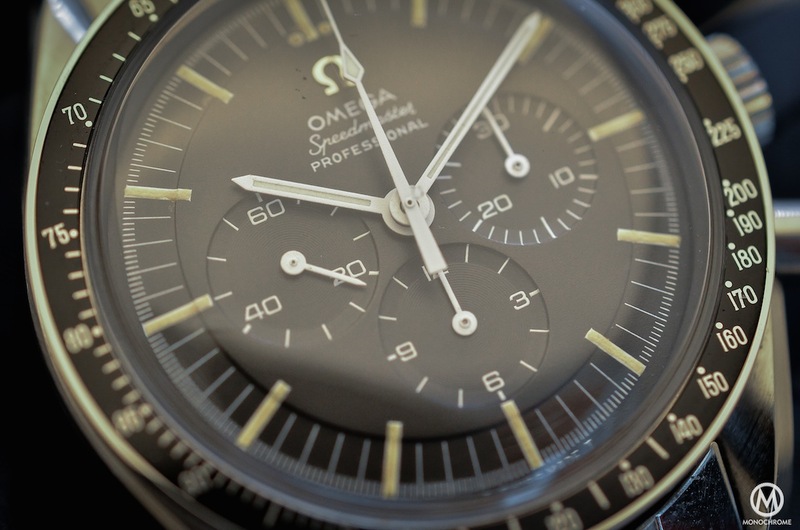 Omega took care to preserve this iconic design, and the success of the ‘Speedy’ never wavered. 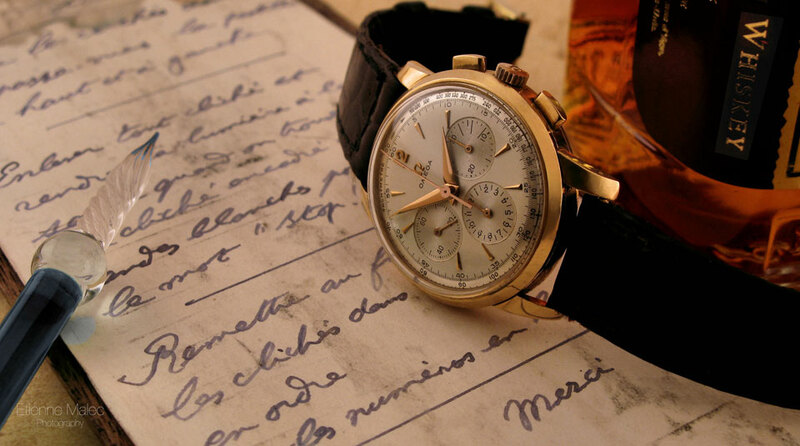 It is a must-have, whether in vintage or modern condition, for every chronograph collection. Next time, we’ll move on to the second part of the history, with very rare and unusual editions: the story of the Alaska Project and the 1970s Speedmasters. Nice article even though some info isn’t correct; for example the last one with the 321-movement was the 145.012 not the 105.012. You are right, that’s changed! Small mistake, huge apologizes! The hands on the 2998 are too short. The minute hand should extend to the edge of the dial. Hello. 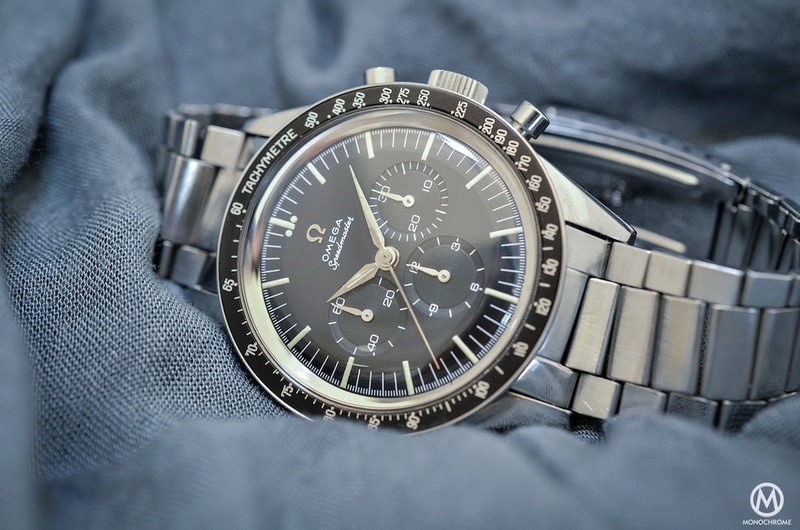 The reference 145.014 is a Speedmaster but not a Moonwatch. It’s a so-called Mark II, an evolution of the classical Moonwatch made from 1969 to the late 1970s. However, even if not a Moonwatch, it remains an interesting and collectible watch, with great look, great history and the same movement as the Moonwatch. Hi I bought a Speedster secondhand about 35 years ago, it had belonged to a pilot and his jacket had scuffed the black bezel. It went back to Omega for a full service which cost me almost as much as I paid for the watch! No idea what its model number is, I will ask next time its serviced, but it has 633 stamped on the bracelet which I guess is just the strap number. Worn every day and given great service. It does not have professional under the name so I am guessing it’s a 105.002 0r 105.003 as it has the thinner hands. Very informative article, much appreciated. HI there, I have been fortunate enough to have my grandfather leave me a Speedmaster St 145003. I have the original international guarantee list a 1968 sold date and guarantee from vendor for watch no A10659. It has a “Placibus” symbol engraving on the back( looks like a horse).. I can’t find a lot of information on the 145 just the 105.003… Is this worth getting appraised and insured. Watch still works and is in mint condition.Also it has been a few years since servicing but cant find a local Omega rep just one that will send it across Canada. i am in the possession of a CK2998 ( i inhereted it from my father who in his turn…well you get the point), a true pre-moon speedmaster. i was wondering how many of these ck 2998’s where made/sold globally? 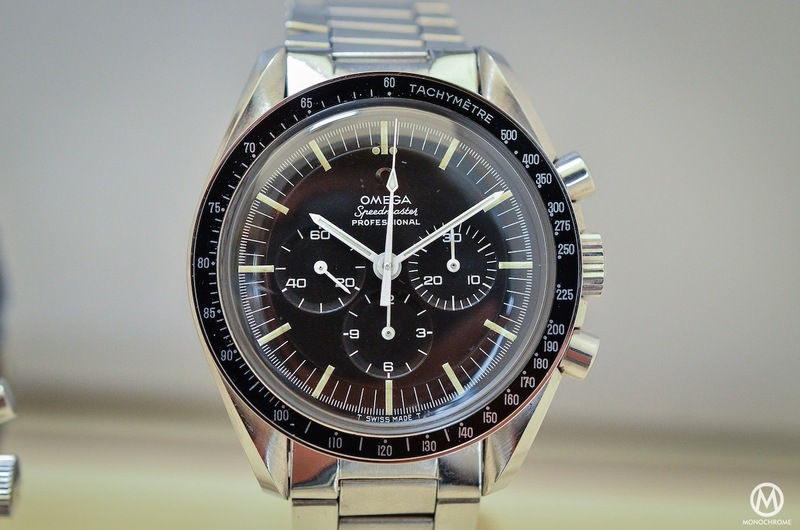 For anyone considering repairs to an Omega (or any Swatch Group watch), I sent a Speedmaster Moon Watch (not sure of the specific model) to the US service center for the Swatch Group just 11 days ago. I asked for a complete mechanical and cosmetic overhaul, including replacement of the lower push-button and the bezel. The push-button came off and I couldn’t find it. The bezel was worn in the 12:00 position by an over-zealous jeweler while polishing the case during prior in-house service. The telephone number and address for the service center are 877-839-5224, 55 Metro Way, Secaucus, NJ, 07094. They sent a carton with foam packaging materials and a pre-paid label to mail the watch to them. I was very impressed with this. However, I have not yet heard back concerning the extent of the required service and the cost. I own a 105.012-65 that was originally owned by an Oklahoma state trooper. I has a mile telemeter bezel which he used to track thunderstorms-direction and distance. I bought my Speedmaster in May 1967 while stationed in Giessen Germany. I really wanted the Rolex Submariner but my finances didn’t justify the Rolex- $125 vrs $94 for the Omega. 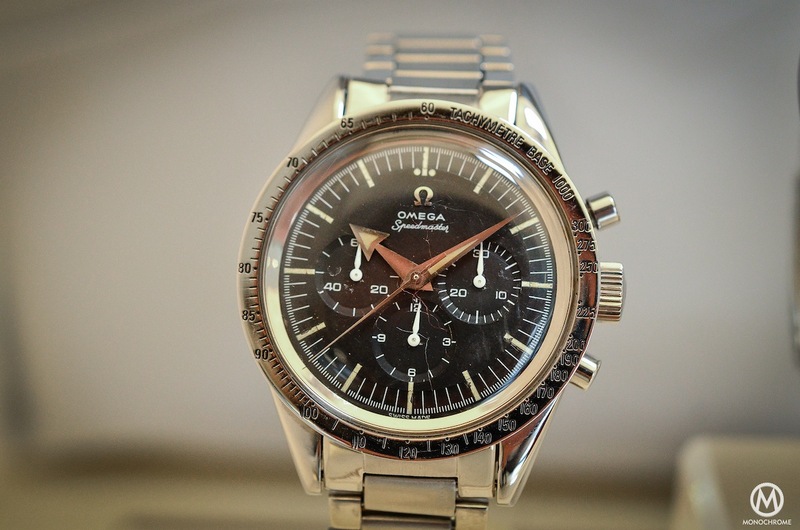 I still have the Omega minus the ss band and just had a complete restoration done. 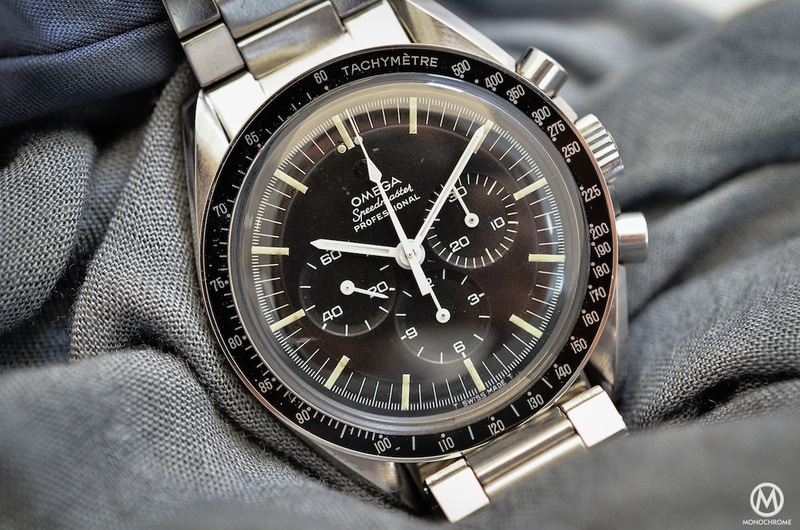 The Speedmaster 105.002 from 1962 has the Alpha hands like the CK2998 and not the baton hands!